Thinking about starting a food blog? It’s the most rewarding project I’ve ever undertaken. These are the food blogging resources I wish I’d started with. These are my best resources – food blog advice, web hosting, WordPress themes and plugins, user analytics and newsletter system – for undertaking such a task. I strongly encourage you to go the self-hosted, WordPress route when starting your site. All the other options are mere imitations. By building and hosting your own website (it’s never been so easy), you have complete control over how you create, organise and and present your work – and you learn essential digital skills along the way. I used to use 1&1 to host my site and it was fine, but when I renamed and redesigned my blog, I decided to upgrade my hosting. This is not my field of expertise, so I did my research, read all the reviews and finally settled on Siteground for the best mix of features, reputation and value. The monthly fee includes a domain, site transfer if you’re moving from another host (I did, it was easy), 1-click WordPress installer/autoupdates and webmail. 30-day backups of your site are also included (very important!). SSD hosting, a dedicated SuperCacher tool and free CloudFlare CDN mean fast loading websites too. With 99.9% uptime. I have had plenty of help from support so far and that has been great too – very patient! I recently helped my sister set up her first site with them and it was extremely easy – my help, I am happy to say, was superfluous. Check out their plans. This blog is a self-hosted WordPress site and I have used a few different premium themes since I started. How my blog looks, as well as what I write in it, are fundamental to my enjoyment of blogging. I truly love beautiful, carefully crafted websites, where style, design and colour have all been truly thought through. I aspire for my blog to fit this ideal. Although there is always more to work on, more elements to tweak, right now my blog looks the best it has ever looked. And this is primarily thanks to Brunch Pro. Brunch Pro is a child theme that runs on the Genesis framework. Meaning that Genesis is a piece of structural software that lays over the core WordPress software and Brunch Pro is what makes it look pretty. 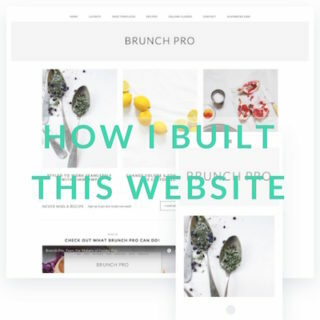 More than that, Brunch Pro is what makes the layouts you see on my site possible. I love the magazine-style layout – I think it gives readers a true overview of all the different content that is available on the site. These fabulously flexible layouts are one of the things that makes this theme so special. That and the endless possibilities for design customisation. And the fact it is designed specifically for food bloggers (although I have seen other non-food websites using it to great effect). For an in-depth look, check out my detailed Brunch Pro theme review. The most popular security plugin for WordPress with an excellent free account. It protects your site against hacking and lets you know if any part of the site has been compromised. Connect your WordPress website to Lightroom and publish directly from your photo editor. Create SEO-friendly titles, ALT text and filenames in Lightroom and see those labels applied in your WordPress media library. Make edits to image size, appearance and labelling, then sync those changes with your website. A superior system! Add elegant sharing buttons to your website (I have them down the side of the page and when you hover over an image) for increased social shares. I use Facebook, Pinterest and Yummly. I used MailChimp’s free plan for the first few years of my website, but my number of contacts rose and I wanted to have more control over automating some of the email processes. I heard about ActiveCampaign on this episode of the Food Blogger Pro podcast (a mine of fantastic food bloggy information – subscribe!). They offer an incredibly sophisticated newsletter service, with all kinds of easy-to-set-up automations. The kind of information you can collect about your subscribers with ActiveCampaign is amazing! Understanding your subscribers better means you can send them more meaningful content – content they really want to click because it fits them perfectly. Check out what else ActiveCampaign can do or listen to that email marketing podcast from Food Blogger Pro to find out more. Google Analytics is great for all kinds of generalised data about your readers, but Hotjar offers something else. A personal touch. With their extremely good free account you can find out all kinds of information about the people that visit your site, what they’re looking for and how they interact with your content. Then use the data to help shape future changes to your site. Another resource I discovered on the inspirational Food Blogger Pro podcast.